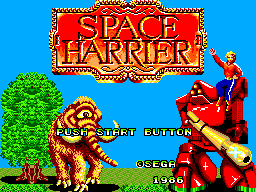 Space Harrier is a third person rail shooter released in arcades late in 1985. Designed by upcoming legendary arcade game designer Yu Suzuki, the game was a massive hit upon release, and has since become an icon of the golden age of arcade gaming. Along with Hang-On (also by Suzuki), it was one of the earliest arcade games to use 16-bit graphics, which - combined with impressive pseudo-3D scaling of objects and environments made possible by the arcade boards impressive architecture - made for a unique and compelling experience, which is still a blast to play today. SEGA's home console of the time - the 8-bit Master System (SMS) - on the other hand, was not designed with scaling technology, nor did it have a particularly wide colour palette with only 32 colours available on-screen at once, compared to the arcade system's 6144 colours. Space Harrier didn't care about this though, as it launched on the SMS a full year later, and brought with it all the hallmarks that made the arcade version so popular. 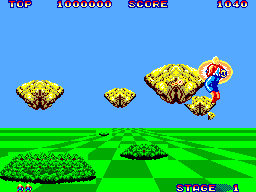 As the player, you assume the role of the titular character Space Harrier. Your aim is to avoid oncoming scenery, enemies, and projectiles to defeat the unique boss at the end of every Round, eventually completing the game. You are automatically propelled forward through the environment and can hover endlessly through the air without penalty, as well as land on the ground and take to running. The design of the game makes it both simple to play yet difficult to master. You need only use the directional controls to move up, down, left and right, and one of the two gamepad buttons to fire your own weapon forward to destroy enemies as they approach. Skill comes in knowing each enemies movements and attack patterns, when to dodge their attacks, and when (or if) to retaliate fire without risking one of your precious three lives, taking in to consideration that you only have one hit per life. Each stage has its own unique set of bad guys to keep the game from becoming stale, and each boss has their own attack patterns and weaknesses to figure out. You need quick hand-eye coordination to last until later stages, as the difficulty increases with every stage. The core graphical style of the game remains the same throughout, culminating in an endless journey in to the horizon and beyond, though every stage has its own unique obstacles and enemies. Each stage also has a distinguished colour palette, and these mimic familiar environments such as green fields, a desert, snow-caps, a techno-style world, and more. Stage-specific enemies such as alien-birds, stone heads, killer robots and, amusingly, one-eyed mammoths also appear, and give the game the light-hearted yet action-packed style it is famous for. Whilst the game lacks the detailed horizons found in the sequel Space Harrier 3-D, as well as the vertical and horizontal camera motion of the original, and it runs smoothly and sprites are instantly recognisable from the arcade as soon as they come in to view. Even though the SMS lacks in power, it runs quite faithfully to the original, minus some minor details such as some airborne obstacles and larger explosions. Every tune from the arcade game makes it to the SMS intact, and they sound wonderful coming from the 8-bit system. The enemies and explosions sound crisp, and whilst the sound effect for the weapon firing isn't recreated authentically, some voice clips from the original have been squeezed in to the cartridge and sound pretty neat. The trademark "Get Ready!" clip from Suzuki's arcade games is announced every time you start a new life, which is pretty impressive, especially when Altered Beast for the 16-bit Mega Drive doesn't do a much better job at producing digitized voice clips. With just a directional pad and one button to hit, the game is easy to pick up and play. The controls are tight and work exactly as you feel they should. Whilst Space Harrier doesn't re-centre automatically like in the arcade version, he is just as easy to manoeuvre around obstacles, and the games hit-detection is perfectly refined, meaning that you won't die unfairly - something that faux 3D games didn't always get right. From start to finish, the game lasts roughly half an hour, that is assuming that you can progress through the various stages to even beat the game; with 18 increasingly difficult Rounds in total, including bonus stages at intervals, the game is a real challenge. There are people who've been playing Space Harrier since release who've never beaten it, and after a good solid 20+ hours, I've still not passed stage 12. You're not just playing against the game though, you're also playing against yourself! You might never beat the game, but at least you can go for the high score; trying to beat your previous attempt and getting that little bit closer to the end. This gives the game much replay value, and you'll find yourself going back again and again to push just that little bit further. 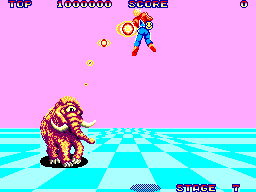 Whether you've played the arcade original or not, Space Harrier for the SMS is worth a go for the sheer enjoyment of flying about as a blonde guy with a laser gun shooting one-eyed mammoths and two-headed dragons. It's highly playable even today, and still looks impressive when you compare it to other games of the time. This is one of my favourite games (despite first playing it less than a year before this review) and if you manage to grab a copy, I'm sure you'll see why. SEGA took the high-tech arcade version and somehow managed to get a faithful reproduction running on the SMS, which is a wonder in itself. It's cool to look at, and it's great fun to play. It even includes an additional boss not found in the original! Give it a go. *Space Harrier SMS is also available on the Nintendo Wii's Virtual Console.